Plans are being hatched to delay Brexit until 2020 to give the UK more time to find an orderly route out of the European Union. After surviving a no-confidence motion thanks to the DUP, British Prime Minister Theresa May has initiated cross-party talks in a bid to end the political turmoil in London. But she faced demands to remove the catastrophic no-deal scenario from the table and consider postponing Brexit Day beyond March 29. And UK Chancellor Philip Hammond told business leaders the “threat” of a no-deal Brexit could be taken “off the table” within days, potentially leading to Article 50 being “rescinded”. EU officials are understood to be examining plans to reset the clock on Britain’s departure from the European Union – but cannot do so without a request from the UK government. Germany and France are willing to extend Article 50. And sources said Ireland “will not have any issue with an extension provided the backstop remains in place at the end”. As the uncertainty grows, plans for a no-deal Brexit here have been upgraded from ‘contingency’ status to the implementation stage. 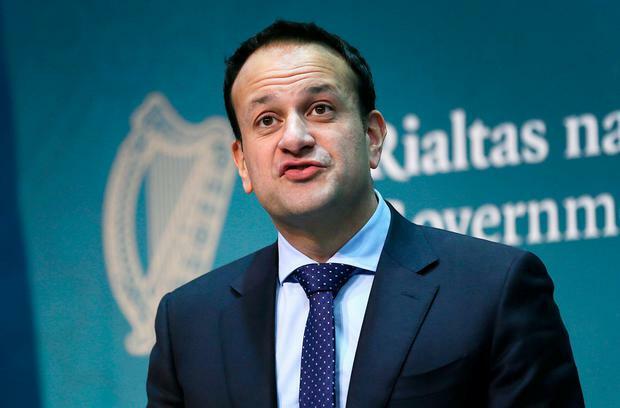 Taoiseach Leo Varadkar told Fine Gael TDs the Government “continue to hold their position and nerve in relation to Brexit”. However, the Coalition was shaken by Transport Minister Shane Ross appearing to confirm Border checks would be needed in the event of a no-deal exit. Tánaiste Simon Coveney was subsequently caught on tape by the Irish Independent telling him “we can’t get into where they’ll be at this stage”. Mr Varadkar again insisted yesterday that there is no “secret plan” to impose a hard Border. “This is a problem that began in Westminster with the referendum on Brexit. We found a solution: the Withdrawal Agreement negotiated over several months and agreed by 28 governments. “Now Westminster has rejected that solution. Therefore the problem lies in Westminster,” the Taoiseach said. He welcomed Mrs May’s move to try to break the deadlock in the House of Commons by meeting with other party leaders. But her olive branch was last night rejected by Labour’s Jeremy Corbyn who refused to have substantive talks the prime minister unless she took ‘no deal’ off the table. “Before there can be any positive discussions about the way forward the government must remove clearly, once and for all, the prospect of the catastrophe of a no-deal Brexit from the EU and all the chaos that would come as a result of that,” Mr Corbyn said. A Downing Street spokesperson said Mrs May was not going to bow to the demand. “The prime minister has been very clear that the British public voted to leave the European Union. We want to leave with a deal, but she is determined to deliver on the verdict of the British public, and that is to leave the EU on March 29 this year,” he said. However, when asked about the idea of delaying Brexit one of Mrs May’s closest allies, Pensions Minister Amber Rudd, last night told reporters nothing should be taken off the table. There have been discussions at EU level about a possible three-month delay – but it is understood the legal implications of stalling the process until 2020 are now being investigated. One hurdle to such a lengthy extension is that elections to the European Parliament are scheduled to take place in May. As a member of the EU, the UK is currently entitled to 73 seats in the Parliament. Northern Ireland’s DUP opposes the idea of an extension, with MP Nigel Dodds saying “it’s not in my view necessary because the EU can act when it wants to…”. The party’s 10 MPs, who support the minority government under a confidence and supply arrangement, proved crucial to Mrs May’s survival last night by margin of 325 to 306. Had they abandoned Mrs May as a protest against the backstop, she would have lost the vote. The prime minister met DUP leader Arlene Foster yesterday who described the talks as useful. The party continues to insist that it will not support any deal which keeps Northern Ireland more closely aligned to EU customs rules than the rest of the UK. During the meeting with the prime minister yesterday, DUP leader Arlene Foster made it clear that her party’s red lines remain in place. However, the EU’s chief negotiator Michel Barnier firmly rejected the idea of backtracking on the Irish specific elements of the Withdrawal Agreement. “The backstop which we agreed to with the UK must remain a backstop. It must remain a credible backstop,” he said. Mr Barnier said he “profoundly” regretted the House of Commons vote to reject the Brexit deal and added it was now up to the British Government to say how it intended to proceed. “An orderly withdrawal will remain our absolute priority in the coming weeks,” he told the European Parliament in Strasbourg. He said there would be a “favourable response” from the EU side if Mrs May was prepared to re-think her negotiating “red lines” and seek a more “ambitious” deal with Brussels. German Chancellor Angela Merkel also said she regretted the decision by British MPs to oppose the agreement.